HAMPTON, Va. (January 18, 2019) – Dr. Shahid M. Shahidullah, Hampton University’s Department of Sociology chair and professor, has recently published his sixth book, “Crime, Criminal Justice, and the Evolving Science of Criminology in South Asia: India, Pakistan, and Bangladesh.” This new book examines many issues and challenges for reforming and modernizing criminal justice in South Asia. 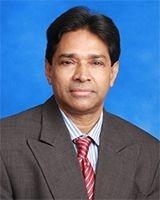 Dr. Shahidullah was educated in Canada and the United States. He has a Master of Arts degree in sociology from McMaster University in Canada, and an M.P.I.A. (Master in Public and International Affairs), M.A. and Ph.D. in Sociology from the University of Pittsburgh. Dr. Shadidullah came to Hampton University in 2015 because “it was a great opportunity. I came to help put together a new program, the brainchild of President Dr. William R. Harvey, to establish a cybersecurity program in collaboration with Hampton University’s Department of Computer Science and I liked that particular approach that he was looking for, a kind of multidisciplinary program of a Bachelor of Science in cybersecurity. That program opened in 2016 and we already have 20 majors,” said Dr. Shahidullah. Dr. Shahidullah’s major research interests that include Cyber Crime, Transnational Organized Crime, Global Terrorism, Crime Policy in America and more. Since its publication in the fall of 2017, “Crime, Criminal Justice, and the Evolving Science of Criminology in South Asia: India, Pakistan, and Bangladesh,” has already been downloaded 2000 times. The material for this book is intended for students who are studying globalization, Asian politics, Asian justice, and those interested about the modernization of crime and justice in general in Asian countries. “Crime, Criminal Justice, and the Evolving Science of Criminology in South Asia: India, Pakistan, and Bangladesh” can be purchased on Amazon.com. Currently, Dr. Shahidullah is editing a volume entitled, “Modernization and Globalization: Issues and Challenges,” which will include chapters written by Hampton University professors, including Dr. Zina McGee, sociology professor, who recently published her first book. “We have so many issues, both in the United States and in the developing world, about Democracy, about equality, equal justice, rights of women, rights of children, so the book is about modernization, about how these different countries are moving towards progress. Moving towards a modern, open, liberal, and global society,” said Dr. Shahidullah. “I’ve been working in this area for almost my whole life. We, as a society, go through ups and downs. It’s not a linear process, so I’m developing a kind of perspective of that kind of modernization growth through conflict and consensus.” This book is projected to be published in late 2019 or early 2020. Dr. Shahidullah came to Hampton University with 30 years of experience in teaching and research and is looking forward to continue to expand the cybersecurity program and writing grants for cybersecurity, while streamlining the criminal justice and sociology programs at Hampton.